...... retrieve all data key identity by internet explorer. Application tool exposes asterisk password ****** character of various login accounts such as yahoo, msn, Gmail, Orkut etc and facility to save all passwords into particular location. * Email Password Cracker Recovers all Internet Explorer saved password lists include FTP, Auto Complete, IE Auto Form and Identity password. 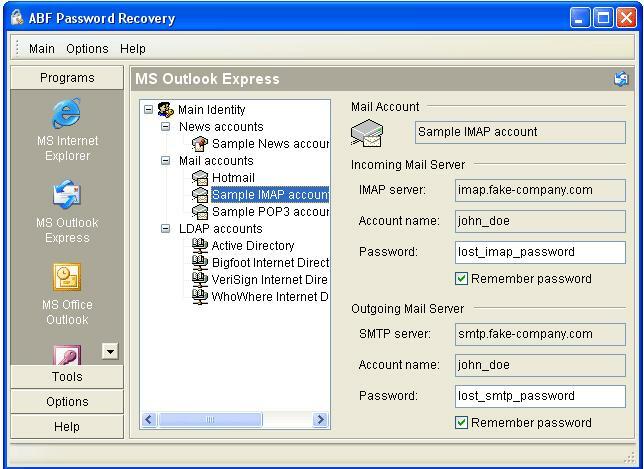 * Password recovery tool having capability to recover all type windows application related passwords. * Utility silently crack email password like Gmail, Orkut, Yahoo and many more. * Tool Unmask and restores passwords hidden behind asterisks and saved into specific location. * Email Password Cracker provides simple and easy GUI user friendly interface supports Windows 95, 98, ME, XP, 2000, 2003 and Vista operating system. Qweas is providing links to Email Password Cracker 2.2.1 as a courtesy, and makes no representations regarding Email Password Cracker or any other applications or any information related thereto. Any questions, complaints or claims regarding this application Email Password Cracker 2.2.1 must be directed to the appropriate software vendor. You may click the publisher link of Email Password Cracker on the top of this page to get more details about the vendor.